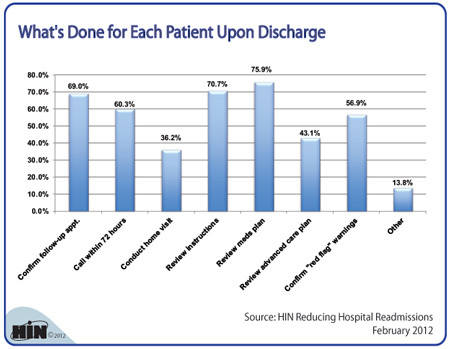 Healthcare Intelligence Network- Chart of the Week: What Do Hospitals Do for Their Patients Upon Discharge? New Chart: What Do Hospitals Do for Their Patients Upon Discharge? SUMMARY: Now that CMS' readmission penalties have been rolled out, hospitals are reexamining the hospital discharge to ensure the transition out of the hospital and the reception into the next site of care is a successful one. We wanted to see which workflows hospitals have established for their patients upon discharge.